Do you usually do something perfectly the first time? Of course not! We all need second chances. What does a second chance mean to you? Maybe for you, a second chance is a way to fix the past and learn from your mistakes. For a homeless person, a second chance means an opportunity to leave the streets and become a self-sustaining member of society. Did you know that we feed up to 200 homeless people every Sunday? Sign up to volunteer to help feed the homeless that desperately need your help. The barriers for homeless people are so much greater than our barriers. For many homeless people, the ability to change their life is an uphill battle. Think it’s easy to get a job when you’re homeless? How can you get a job after a long period of joblessness? What happens when they ask for your address? Forget about fair employment opportunities. Combine this with a lack of self-confidence, and people become chronically homeless. What does chronic homelessness mean? It means it’s almost impossible to get out of homelessness after 18 months. By providing a life skills education, interview skills and employment opportunities, Food on Foot is giving our homeless in LA a second chance at becoming self-sustaining members of society with full-time jobs and housing they can afford. 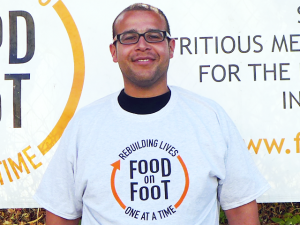 One shining example of how Food on Foot has made a difference is Herbert M., a recent graduate from Food on Foot’s Work for Food program. (Pictured above). Herbert was born and raised in LA’s MacArthur Park area. He was involved with gangs and drugs at a very young age, and found himself in and out of jail throughout his teens and early twenties. To make matters worse, he lost custody of his son, lost his job, and soon found himself sleeping outside. After bouncing from one homeless shelter to another, Herbert was given a flyer for Food on Foot’s Work for Food program, and his life made a dramatic change. He passed a background and drug test, and enrolled in FOF’s Work for Food program where he demonstrated responsible work habits by cleaning the streets of Hollywood in return for fast food gift cards. The program also equipped him with positive values, life skills, and most importantly, the confidence needed for him to turn his life around. YOU can make direct impact with the homeless by volunteering for a Sunday serving. Your $20 donation goes towards purchasing the food gift cards that we distribute to the top workers of our Work for Food program. People like Herbert! On May 15th, 2016, Herbert was promoted to a “Gray Shirt”, and became a supervisor and mentor of the “Green Shirts” during their weekly trash cleanup duties. Herbert also received an apartment and a full-time job as a dishwasher at Palomino in Westwood. Herbert’s hard work and dedication has also positively affected the people around him. Herbert has recently been awarded weekend custody of his six-year-old son and has also strengthened his relationship with his son’s mother. One of Herbert’s proudest realizations is that he can now be a positive role model for his son. The experience Herbert had with Food on Foot has made him want to go back to school and study to become a drug and alcohol counselor. “Food on Foot makes you a better person. They treat me differently from the other programs that make you feel like you’re nobody just because you’re homeless. Food on Foot is humane. If someone lends you their hand, you have to appreciate it and keep that same door open for other people.” – Herbert M.
By volunteering at a Sunday serving, you’ll get a firsthand look at the appreciation that our Work for Food participants have. You’ll listen to each participant’s weekly “random acts of kindness.” Its a heartwarming way for you to see how our homeless participants are giving back.